are three windows on each side and a large window behind the choir, which is directly behind the pulpit. Land for a church cemetary is donated by Dr. george and Nellie Hood "in consideration of $50.00" paid by Baptist Center Church trustees (deed filed in 1912). The original church is torn down to make room for a larger facility. school rooms seat 200 persons. The total value (much of the labor and materials is donated) is $3000. The Baptist Center Schoolhouse holds services in the interim. The church is burned to the ground when an ash is accidentally dropped by a cleanup crewmember in the newly stacked wood box located inside the church. The cornerstone is laid for the new building. painting of the Jordan River donated by former pastor and his wife, Rev. and Mrs. Clarence Teague. The fire-scorched pews salvaged from the fire are replaced with new ones. 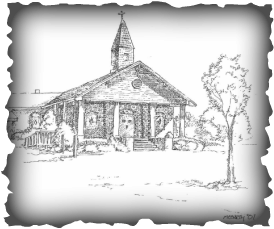 The church borrows $3000 for a new fellowship hall and parsonage. The church fellowship hall is completed. The sanctuary is brick veneered for $6000 minus other needed repair costs. Stained glass windows are added throughout the main church building, paid by a window fund started May 6, 1964. Two classroom additions with bathroom facility (625 sq. ft.). Bid $20,840. Added a three-room portable unit for Sunday school rooms. Began renting house as Sunday school space.